The St.Joseph’s annual Golf Classic takes place this Saturday 28th April 2018 in West Middlesex Golf Club. Tee Off starts from 11am and the entry fee is £50 per golfer which includes a meal afterwards. Therefore a last call if there are companies/businesses out there who would like to get involved in sponsoring a hole or tee or indeed any players who would like to play a round, please get in touch on the below contact number or contact either of our social media pages. The seniors took on Garryowen on Saturday 21st May in the Scrubs and ran out comfortable winners in the end on a result of 1-17 to 1-04, well done to all involved, a great way to kick off the season. Training continues each and every Tuesday and Thursday night in Perivale at 19:30. Please keep an eye on the Twitter and Facebook pages for any updates. The Senior team are due to play Thomas McCurtain’s this weekend in the 3nd Round of the Murphy Cup in Goodmayes – throw in for this one is at 12:30. 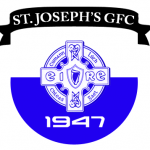 Then in quick succession the Joes have their rearranged fixture with St.Brendans from Round 1 of the Murphy Cup taking place on the 01st May at 19:00 that evening – this one is taking place in Greenford. Again if there are an updates please keep an eye on our Facebook and Twitter page. On Saturday 21st the Junior Joes got back out playing in Boston Manor park with a great turnout - Brilliant to see so many of the guys down getting involved supporting and assisting. If you have a child U12 or younger that want to play Gaelic Football please contact Derek on 07527711759 and additional if there are any parents who would like to get involved in coaching please get in touch on the same number.